I was a big fan of the original LEGO Batman game, and not just for the obvious reason of being a guy who really likes both LEGO and Batman. It had a very clever setup, in that after you played through a level as Batman and fixed all the stuff that the bad guys had broken, you could then flash back and play through as the villains as they went through messing it all up. 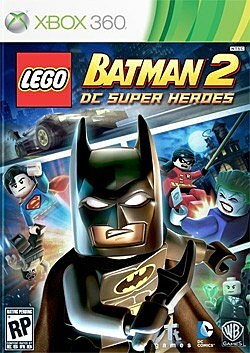 It was a really nice gimmick, and Batman's one of the few characters whose villains are interesting enough on their own to pull it off, so when I popped in LEGO Batman 2: DC Super-Heroes, I have to admit that I was a little disappointed that it was a lot more linear. But then Superman showed up about five missions in and turned it into LEGO World's Finest, and everything got awesome all over again. For those of you who haven't played LEGO Batman -- or LEGO Harry Potter, or LEGO Indiana Jones, or any of the other licensed LEGO games developed by Travelers Tales over the past few years -- they're essentially puzzle-platform games. You run around in an level that's based on whatever licensed property the game is tying into, trying to get past obstacles by creatively using your environment. And by that, I generally mean smashing up everything you see and then using the pieces to build something new. On that front, it's a pretty perfect video game translation of what you're supposed to do with the actual LEGO blocks. I like a lot of the games quite a bit, but the Batman one has always been my favorite because it wasn't tied to a particular story. As much fun as it is to see the games take a shot at doing a kid-friendly version of, say, the scene from Raiders of the Lost Ark where the big Nazi boxer gets chopped up by an airplane propeller (which, it turns out, is surprisingly easy since even LEGO people are meant to be cheerfully and bloodlessly taken apart), it's also a little limiting. The most fun parts of the games are when they're able to go off the script and do something new, and the first Batman game was full of that. On that front, the new game definitely lives up to its predecessor, especially since they've added voices. With the other games, they weren't really necessary, since they had absolutely no illusions of anyone who wasn't already familiar with Star Wars or Harry Potter picking up the games and learning the plot there. Here, though, the addition of the voices allows them to build a plot that's a little more in-depth, while still keeping that comedic edge to it. And it is funny. The game's full of great gags, most of which come courtesy of the "Gotham News Network" cutscenes between levels, where we find out that Gotham City's banks are out of money due to repeated heists, and that the police are advising citizens to avoid problem areas like the zoo, the botanical gardens, the amusement park, and the entire Southern island. Plus, you get to hear Clancy Brown doing the same incredible job voicing Lex Luthor as he did on Superman: The Animated Series and Justice League Unlimited, but going for hilarious instead of sinister. 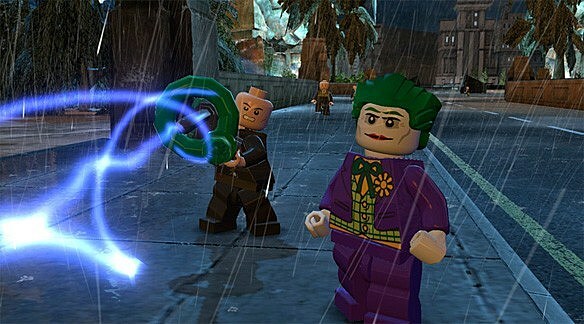 The plot of the game is a pretty incredible fusion of the LEGO games and the DC Universe: LEGO Lex Luthor has invented a laser that destroys anything made of shiny black bricks, and as you might expect, virtually everything that Batman owns is made of shiny black bricks, along with most of Gotham City itself. The problem is that it's powered by Kryptonite (because why would Lex Luthor build anything that wasn't powered by Kryptonite), so he and the Joker team up to raid Batman's hilariously massive "Just In Case Superman Goes Bad" Kryptonite stash. Also, this is all happening on the eve of Lex Luthor's campaign for president. Clearly, a Luthor-Joker team-up is big enough to involve Superman, and eventually things get so far out of hand that the entire Justice League shows up to help out too, and that actually leads to a pretty great moment where the storytelling and the gameplay both manage to support the same thing. One of the interesting differences between LEGO Batman 2 and its predecessor is that in the first game, Batman was almost always played as the straight man to everyone else in the game. There are a couple of exceptions, like Batman doing online shopping at AwesomeCapes.com from the comfort of the Batcave, but a lot of the comedy in that game came from the fact that Batman himself was deadly serious even with all the slapstick that was going on around him. In the new game, though, they actually make Batman a comedic figure in a way that works really well. He's extremely grumpy whenever any other heroes show up in Gotham -- moreso than usual, I mean -- and his clear discomfort over Superman showing up and happily saving him is the source of a lot of comedy. In fact, most of the time you spend playing as Superman is hilariously devoted to rigging up a path for Batman to follow so that you don't actually have to go through the indignity of carrying him around. But while it's often played as insecurity over his own lack of powers, it's explicitly stated that he's just really uncomfortable relying on anything but himself. And that's perfectly reflected in the gameplay. 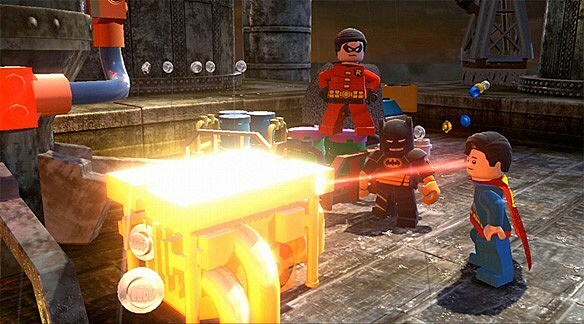 Like in the first LEGO Batman, there are a lot of different kinds of bricks that can only be affected by specific abilities: Metal pieces have to be blown up with explosives, shiny blue bricks are magnetic, waterfalls can be frozen, and so on. Batman and Robin are extremely limited in the game, and in order to deal with that stuff, have to switch to different suits that give them one specific ability each. Swapping between the suits is one of the core mechanics of the early levels, and one of the things that keeps you from finding all the secrets until you play through again in Free Play mode. But when Superman shows up? That dude doesn't need a special suit. He can fly, blow stuff up with heat vision, freeze water with his super-breath, see through walls, move heavy objects, and he's completely invulnerable to damage. You get to walk and drive around as Batman and Robin between the early levels, but the first time you get to explore it as Batman and Superman brings such a good moment. When Superman starts flying, and the Danny Elfman Batman theme fades out to be replaced by the John Williams Superman score, it's just fantastic. And it's so much easier than playing as Batman. You can zip around, knock out a bunch of bad guys (and recruit them as playable characters), explore the tops of the skyscrapers without having to go through the little obstacle courses that the game sets up, it's just so much easier. So a few levels later, when Superman is weakened by Kryptonite and faceplants every time you try to fly, it actually feels like it means something. And you really get Batman's point: You -- and by you, I mean I -- got lazy relying on Superman, and now you have to do things the hard way. It's really neat, and a pretty fun way to tell their story. Because in the end, despite the addition of the other DC characters, this is a very Batman-centric game. That's actually one of the major flaws: As much as being able to play as Green Lantern, Flash, Wonder Woman, Cyborg and a bunch of other characters is a major selling point, they don't actually show up until the very end of the game -- a few of them are even rewards for beating the last level, which really defeats the point. The game is designed to be played multiple times, using different characters' abilities to get all the secrets in each level, and while that part's done really well with the characters' abilities actually feeling pretty unique, it's still pretty disappointing that you have to go through the entire game first before you're able to play as Flash or Lex Luthor. Also, the massive Gotham City environment is pretty cool, but having such a huge hub area makes things so spread out that actually finding anything is a lot more difficult than it was in previous games. That might be by design -- once you find the ability to double or quadruple your score, the game's currency system becomes pretty meaningless. And that's good too, since all the secrets -- characters, vehicles, cheats and the like -- need to be found and purchased. So really, it's not a perfect game. But it is a pretty fun one, and as far as video games about Batman go, well... Look. 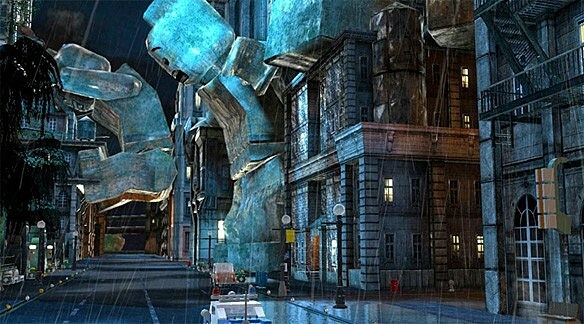 I'm not going to say that it's better than Arkham City. But I will say that one of those two games lets you play as Superman and ride through Gotham City on a gorilla, and the other most definitely does not.